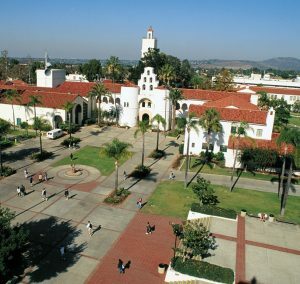 San Diego State University, established in 1897, is the third largest institution among the 21 campuses of the California State University system, as well as one of the largest in the nation, with over 35,000 undergraduate and graduate students. The University offers undergraduate studies leading to bachelor’s degrees in than 85 areas, master’s degrees in more than 75 areas of study, and the PhD in thirteen disciplinary areas as well as the EdD and the AuD. The SDSU School of Speech, Language, and Hearing Sciences, first established in the 1960s as the Department of Communicative Disorders, consists of the separate but related professions of speech-language pathology and audiology. The school’s programs are designed to provide basic and advanced professional preparation, with a strong commitment to theoretical and research foundations of clinical intervention. In order to provide students with “real world” professional experiences, the school maintains contractual relationships with community clinics, hospitals, agencies and educational institutions. Through its Audiology Clinic and Speech-Language Clinic, the school offers diagnostic and rehabilitative services to University students, faculty and staff, as well as to individuals in the San Diego region.